The years leading up to the First World War saw interest in Shakespeare reaching a high. 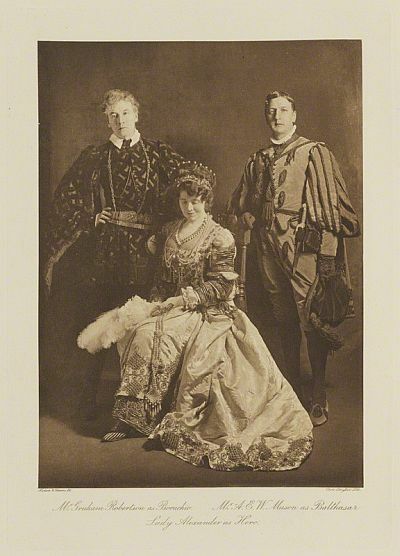 In Stratford there were events relating to the rise in folk traditions of singing and dancing, but in London the movement to found a National Theatre based around Shakespeare’s works was gathering steam with the 1908 foundation of the Shakespeare Memorial National Theatre Committee. The idea of a National Theatre had first been mooted over fifty years before, England being one of the few European countries with no national theatre. The Committee’s major fundraising event was to be a Shakespearean Ball. On the Royal Albert Hall’s website this is described as “probably the most spectacular event ever held at the Hall”. I had barely heard of this event until it was mentioned at Professor Michael Dobson’s excellent inaugural lecture given earlier in October 2014, in which he examined the history of the idea of a national theatre and Shakespeare’s role in it. The whole lecture is available to be viewed here on YouTube. A Shakespeare Memorial Theatre already existed in 1908, but being situated in a small provincial town it was not national enough. Only the capital would do. The ball was a magnificent party organised by the rich and famous, for the rich and famous. The main organiser was Mrs George Cornwallis-West. 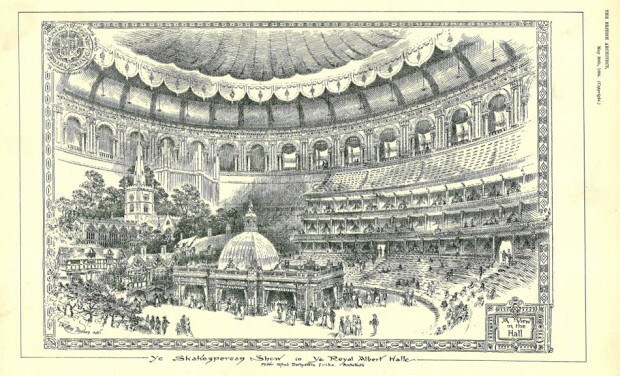 Earl Lytton enthused: “The decorations of the Hall itself, the beauty of the costumes, the rhythm of the moving figures in the great quadrilles, the colours, the lights, the gaiety – all produced an effect of brilliance and splendour which will long live in the memories of those who saw them”. 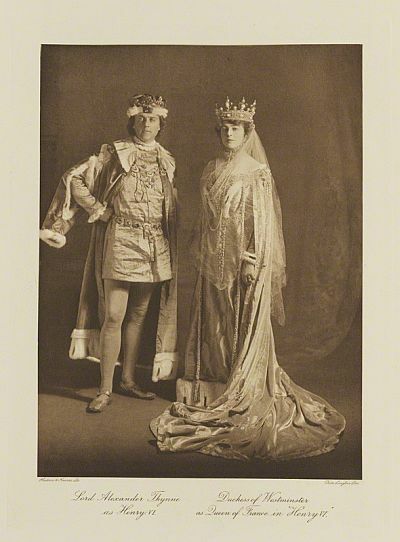 Many guests dressed as characters from Shakespeare’s plays, each one organised by a lady, so the Marchioness of Salisbury was in charge of The Merchant of Venice. Some leading actors appeared, such as Ellen Terry and Henry Ainley, but most parts were taken by “the best-known people in London”. Some were dressed as the court of Queen Elizabeth: “Nearly all…were either direct descendants or the wives of direct descendants of the historical characters they played”. “Here were no tawdry stage costumes, no mere imitations of reality. Here was the real thing. Real satins and ermines, real silks and brocades, real gold and silver embroideries, real lace of the finest periods…And among the sheen of wonderful stuffs there was the sparkle of jewels, real jewels, priceless heirlooms…Many single dresses cost upwards of a hundred pounds each, and many wearers were adorned with thousands of pounds’ worth of precious stones.” With so much expended on specially-made costumes, the figure of £10,000 raised for the Theatre Fund must have seemed rather small. The Hall was decorated by Sir Edwin Lutyens. A blue sky hid the roof, there were grape vines, green turf, and “bowers in a tall hedge of clipped yew, with quaintly fashioned birds topping them, after the manner of old-world gardeners”.. The following day The Times devoted over a page to the ball and reports appeared as far away as New Zealand. 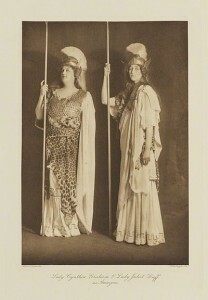 Mrs Cornwallis-West compiled a magnificent volume, Souvenir of the Shakespeare Memorial National Theatre Ball that includes photographs of many of the participants in their finery. A copy is held at the Shakespeare Centre Library and Archive in Stratford-upon-Avon. Stratford-upon-Avon, and its Shakespeare Memorial Theatre, is not mentioned, though the town’s most famous resident, Marie Corelli, took a box. A set of 29 portraits is to be found on the National Portrait Gallery’s website. Slightly mysteriously, the image reproduced, which I’ve found on the Royal Albert Hall website, shows Stratford buildings: Holy Trinity Church, the Birthplace and Anne Hathaway’s Cottage, but none of the descriptions mention them. The following year Mrs George Cornwallis-West planned another Shakespeare-related fundraiser, a Shakespeare Exhibition at Earl’s Court, running from May to October. Like the ball, it was designed by Lutyens who supplied replicas of buildings such as the Globe Theatre and the ship The Revenge. Although there was an exhibition of original paintings and other objects from the period, the rest of the exhibition was more The Merrie England Experience. Inside the buildings were events such as dancing, madrigals, concerts of Elizabethan music, performances of the Pyramus and Thisbe scene from A Midsummer Night’s Dream and the trial scene of The Merchant of Venice. There was a medieval tournament with real tilting. 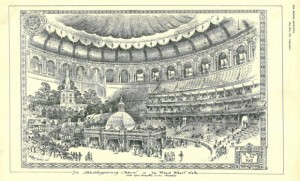 Balls were held including, on 27 June, the Venetian Bal Masque priced at 30 shillings. Food outlets included the Boar’s Head Tavern with anachronistic offerings such as afternoon tea. Unlike the ball, which seems to have been admired by all, the six-month long exhibition attracted criticism. The expense of maintaining the various events was high, and Mrs Cornwallis-West “relied too much on her personal influence and not enough on the power of the press”. The society network that made the ball such a success did not work when interest had to be maintained over a long period. Those who attended the 1911 ball felt they had been at a special, unforgettable event. In his essay in the Souvenir volume H Hamilton Fyfe wrote “The Shakespeare Ball of King George’s Coronation year will live in history…Those who were fortunate enough to see it have something to recollect all their lives”. In his epilogue to the same book, Israel Gollancz hoped “may they all dance again…at the Shakespeare Ball in the Shakespeare Commemoration week of 1916”, an event that of course never happened, with many of the countries whose representatives had danced together in 1911 embroiled in war against each other. A hundred years on, the ball has been forgotten. It now seems like the final flowering of a way of life cut down by World War 1. Since 1923 the Royal Albert Hall has been the venue for another great but sombre event, November’s national Festival of Remembrance. This entry was posted in Legacy and tagged Earl's Court, Edwin Lutyens, Marie Corelli, Michael Dobson, National Theatre, pageant, Royal Albert Hall, Shakespeare Exhibition, Shakespeare Memorial National Theatre Ball. Bookmark the permalink.